Abutilon plants or ‘Chinese Lantern Plants’ are related to hibiscus and are a useful landscaping and garden plant as they are long flowering and generally low maintenance. Wholesale nurseries are providing an ever increasing range of hybrids. Flower colours are the main improvement, although some variegated foliage forms are also available. The white flowering variety ‘Boule de Neige’ is particularly popular, as are some of those with heavily veined flowers. We are mainly offered Abutilon x hybridum, and this gives us the large range of flower colours from white to yellow through to pinks and reds. Recently new low growing or dwarf varieties that will reach around 1.5m in height are being promoted by some growers. These are suited to container growing, and the long flowering nature makes them useful in this context. Recently a few double flowering varieties have been offered by some wholesale growers. Some of the species, with attractive bi coloured flowers are also available from specialist growers. 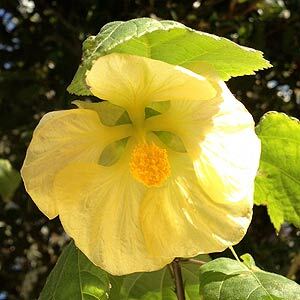 Growth can tend to be a little lax however Abutilon can easily be pruned by general garden contractors to maintain shape without risk of damage. These are an ornamental perennial in Australia and are treated as such. Available in sizes ranging from tube stock to 200mm pots ready for planting.